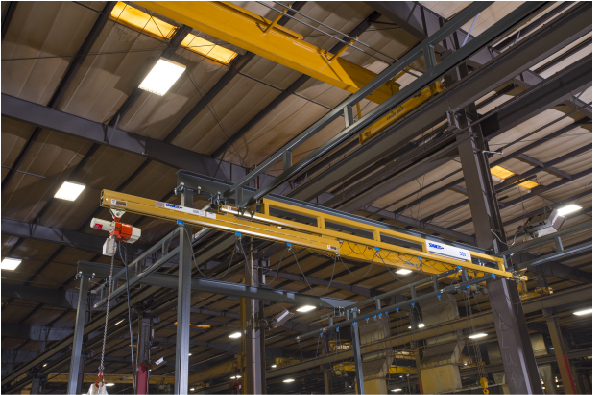 Whether your facility is lacking overhead space or there are multiple overhead obstructions to contend with, installing an overhead crane can be cumbersome. However, there are economic solutions for applications requiring overhead lift in a facility where headroom is limited. Under-running bridge cranes are ideal for applications requiring overhead lift in a factory with low headroom or limited factory space. Under-running cranes are designed for flexibility and functionality. While top-running cranes are designed to lift massive loads, under-running cranes provide an ergonomic design that offers versatility and usability. That’s because under-running bridge cranes travel beneath the runway, which allows you to maximize the distance from the ground to the hook. Under-running cranes use end trucks that travel on the bottom flange of the crane runway and can be suspended directly from the overhead building structure without the need for interfering support columns. An under-hung crane system is generally much lighter than a top-running system, and a long under-running system can easily operate using multiple runways—even in very wide bays. This helps to both minimize the depth of the bridge girder and decrease the weight of the operating equipment, resulting in lower equipment costs and lighter design requirements for the building or support structure. If your application requires the use of an overhead bridge crane system, but you’re concerned about low headroom, too much weight on your support structure, or maximizing your lift distance, an under-running, enclosed track workstation bridge crane may be the perfect solution for your needs. Let’s look at some advantages of a top-running workstation bridge crane, along with some potential disadvantages—depending on your application. Most enclosed track workstation bridge cranes are designed for lighter loads than top-running bridge cranes. A workstation bridge crane with enclosed track is usually rated for loads up to 4,000 pounds, so if your application requires very heavy lifting, it may not be the system for you. But, many applications in manufacturing and other industrial sectors don’t necessarily require a lift system with that type of lift power. And, with additional capacity comes added pressure on your structure or support system, which can be very costly, and perhaps even completely implausible in a tight factory. Workstation bridge cranes can be freestanding with supports or ceiling mounted. The enclosed track allows the trolley to move smoothly, making it easier to operate and control than other systems. The track’s V-shaped profile also prevents dirt and accumulation from forming inside the tracks and maintains end truck and trolley-wheel alignment. The trussed enclosed track permits increased spans, which means fewer supports are needed for runway space. That also helps to keep overhead space clear. Under-running workstation bridge cranes are easier to install, expand, and relocate. They can operate beneath overhead obstacles and even larger overhead cranes, if equipment is more of a concern than factory space. Another major advantage to using under-running workstation bridge cranes is their unique ability to operate side-by-side without interfering with one another or the overall operation. In fact, multiple under-running crane runways can be installed adjacent to one another and operate simultaneously. They also have the ability to pass each other on independent runways, providing extra flexibility and coverage. Top-running crane systems can’t accomplish the same multiple service set-up, unless they are supported with auxiliary columns or gantry legs. Auxiliary columns and gantry legs both interfere with operations and cause floor obstructions that can lower productivity and efficiency. If you’re in need of an overhead lift system to meet your material handling needs but your factory can’t support a top-running bridge crane and your application does not require very heavy lifting (over 4000 pounds), an under-running, enclosed track workstation bridge crane may be the best solution for your operation. With multiple options like telescoping bridges, tractor drives, double-girder nested trolleys, and cantilevered runways, workstation bridge cranes are easily customizable to your needs and will help you to make the most of your factory space.